In a previous blog I wrote about not being pleased with myself as a person, and how I put two reminders into my calendar on alternating days to help me change my behavior. I mentioned recognizing the need to praise people more often instead of pointing out what I thought they hadn’t done well. Putting in the reminder “praise somebody” every other day helped me modify my behavior. 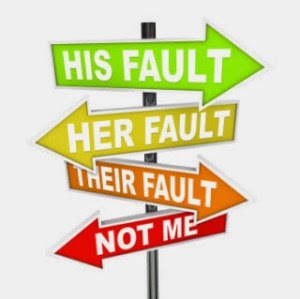 On the other days of the week I put into my calendar “no blame.” I did this because, when faced with a situation that had gone awry, my tendency was to focus on who was responsible instead of how the mistake could be avoided in the future. Basically, what I had to learn to think and say was, “what could we do to prevent this situation from occurring again?” instead of “why did you make this mistake?” I was focusing on our company working together to avoid mistakes by changing the language. When a person is asked “why did you …?” his/her defenses automatically go up. I was usually projecting displeasure and frustration with both my tone and my body language, and all that the other person was looking forward to was leaving the interaction as soon as possible. I did not morph into a person who was pleased with mistakes and things not going well. What did happen was that I became better at responding less emotionally to reality. Consequently, when things did go wrong, I was more likely to be able to lead our company to a solution instead of creating more problems with my inappropriate behavior. The behaviors I was working on changing were/are my challenges—and each of us has our own. By taking responsibility to become more of the person you want to be instead of tolerating who you are, you become more of the leader that your company and employees want and need you to be. It takes work to make it work. Try it. The outcomes are often less stress and greater profits.